If you haven't noticed, I'm quite a bit of a makeup brush fanatic and have over the years, amassed a sizable collection of brushes. I still add to that collection on a periodic basis just so I can have many of the same type of brush and I don't have to spot clean it every time I use the brush for different colours. But at the end of the day, brushes need to be properly cleaned to remove from it, the product build up and the oil and sebum that gets transferred from the skin to the brush during use. 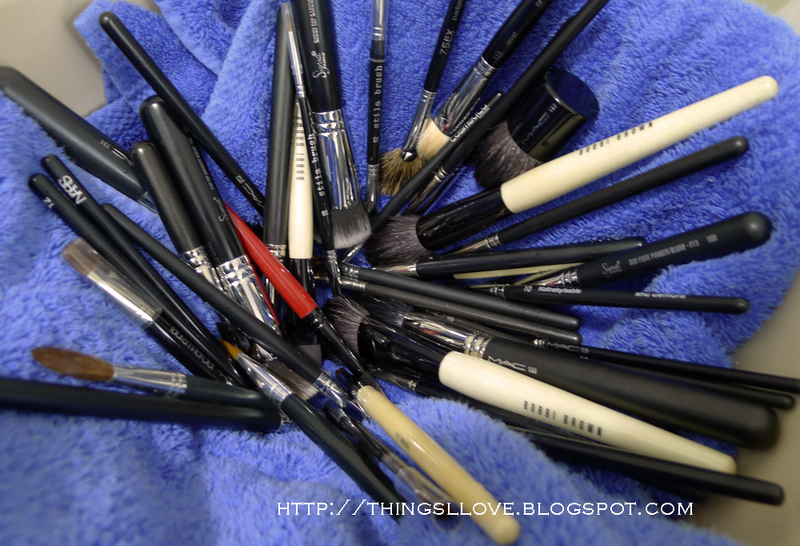 As I have a lot of brushes to wash, I tend to give them a deep cleanse every fortnight if I've used them frequently and have run out of clean brushes during that time. If I haven't (or am a bit lazy and don't have the time), I'd clean them every 3 weeks in bulk and the whole process of washing and towel drying can take up to an hour. I use all 3 of the below products to do the actual washing of my brushes. (1) - Clairols Herbal Essence Replenishing Shampoo for coloured/dry/damaged hair. I find that this shampoo doesn't have the silicones that many other shampoos contains, instead it has natural oils to help soften and condition the natural bristles of the brushes. Its something I use on my hair already so I don't need to go out and buy another shampoo for my brushes. (2) - B&C AHA Cleansing Oil. I use this facial cleanser to help cut through the grease in brushes used with emollient products like foundations and creme blushes. The oil cleansing theory for your skin works the same for the brush bristles and are particularly effective with synthetic brushes which tend to contain foundation and concealers product build ups. 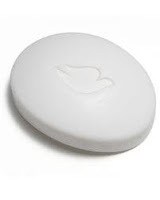 (3) - Dove Cleansing Bar. I only use this for white bristled brushes where even though clean, the hairs are still stained. I would wipe the wet brushes on the cleansing bar and work it into a nice lather in my palm before rinsing out. This seems to get rid of any stains 99% of the time. I find the MAC fibre optic hairs (eg. the MAC 187 or 131 brush) and white hair facial brushes are the hardest to get back to the pristine white conditions. Wet brush hairs with water and avoiding wetting the metal ferrule, squirt some #1 to clean the brush. If it is a foundation or concealer brush, squirt a pump of product #1 & product #2 liquid on brush and then brush the hairs up and down the palm of my hand to work up a lather. Squeeze out the excess water from the bristles to remove the product build up. Wash it with a bit more water and repeat with more cleansing liquid again if required until when the brush runs clear when rinsed under running water. If the bristles are still looking stained at this stage, this is where I give it another lather using product #3. Place brush bristles down on a basin/tub lined with a bath towel to soak up extra water. 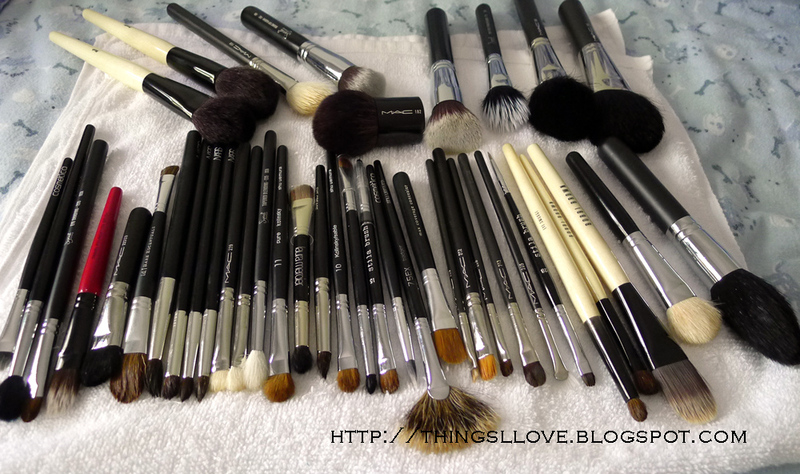 Continue washing other brushes. As you can see, my deep cleansing method is quite intensive but it is the most thorough way and it definitely gets all the brushes looking and feeling brand new again. Face brushes generally take the longest to clean whilst the smaller eye brushes can be cleaned very quickly and don't need repeated washes. After all my brushes are washed, I take each one and wipe it back and forth across the towel to remove excess moisture and wipe the ferrule down before lying them flat on top of another dry towel to air dry. Because excess moisture is removed with the towel drying process, the smaller brushes are usually dried and can be used again in less than 6 hours time whereas the larger denser brushes (the Sigma HD brushes or kabuki brushes) can take up to 2 days before being completely dry. I usually don't use brush guards when drying my brushes because I find that it slows down the drying process but I do use them to reshape the brush when the brushes are almost dried. So that's how I deep cleanse my brushes. If you have any questions about cleansing makeup brushes or you would like to see a review on a particular brush soon, please send in your requests. Wow your so thorough. You have given me some much needed tips to get my brushes back into top condition. The white brush thing annoys me the most! Great post!!! I need to buy some cheaper cleansing oil & soap bars! !